Yet it's on the palace training grounds where Evony's archery skills gain her the respect of soldiers and legates alike. The emperor himself takes notice of the beautiful, ruthless warrior. In turn, the young, steely eyed Galen is nothing at all what Evony expected. Either way, the honor of the Amazzi people and the future of the empire now rests with Evony of Aureline. For she is the Emperor's Arrow. The Emperor's Arrow begins by introducing us to Evony as a fairly unstoppable warrior - she can hit a single leaf in a tree with an arrow, and her prowess doesn't diminish through the story. She's loyal to her friends and to the emperor, brave and strong, which is pretty much what I look for in a fantasy heroine. Unfortunately she's all these things to a fault - being that she doesn't really have any faults. I did enjoy her adventures as a character, but there wasn't really much character development beyond her discovering that she could fall for a man - and this also, unfortunately, wasn't all that convincing to me. She's just a bit too cool, so I couldn't totally see what she saw in the emperor. It didn't help that we don't get to know him very well - the story is entirely set from Evony's perspective and I struggled a little to fall into the romance from this limited side. There wasn't enough build up for their feelings... and then suddenly they were deeply in love. So yeah, that's a little negative of the romance, I must admit. However, I did end up enjoying this novel. As a fantasy read, it has a lot to offer. Like I said, while Evony could do with a little more character development, she is an exciting protagonist. We also have some other interesting characters, particularly her friend Admina, who is a much quieter, but no less interesting character with perhaps even more of a story to tell than Evony. The world building in The Emperor's Arrow is also really good. I liked the court intrigue, and the descriptions of the clans and all their cultural differences. This, along with quite a bit of action, made the story worth reading in the end, even if it wasn't quite what I was hoping for when I picked it up. 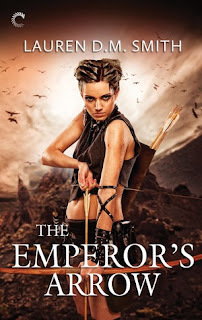 The romance in The Emperor's Arrow didn't quite work for me, but it is nonetheless an enjoyable fantasy read with an exciting world. I'll be interested to see what else Lauren D.M. Smith comes up with. The Emperor's Arrow by Lauren D.M. Smith is a fantasy romance, released by Carina on July 1, 2016.